I remember the day well. It was one of my first times playing Star Trek, and several of us had bought some packs of Call to Arms. One of my fellow players cracked open a pack containing Locutus, Voice of the Borg. Since I recognized the character immediately, I assumed he had to be among the rarest of cards in the set, and joked about how funny it would be if I opened another one right behind him. And then it happened. My very next packed contained none other than Locutus, Voice of the Borg. 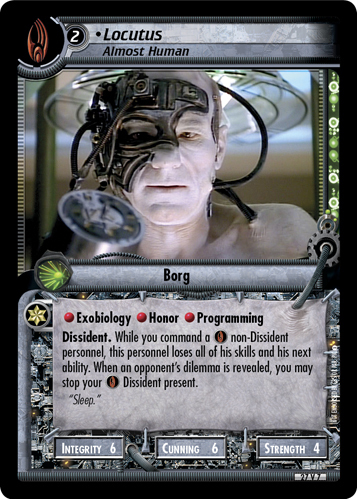 Since that day, Locutus has remained one of my favorite characters both in Star Trek itself and in the card game. As the Borg Dissidents were spoiled leading up to Unity, I pondered about who else might qualify for the team. It struck me that any Borg who experienced individuality could be a Dissident. And who pioneered the idea of separating from the Collective? None other than our friend, Locutus. A name as big as Locutus needs an ability to match. I thought back to the final moments of Best of Both Worlds, Part II. What did Locutus do while he fought for his individuality? He only said one word: Sleep. And that one word inspired Locutus' ability. He can put his fellow Borg to sleep. Locutus' ability might seem useless at first. Who wants to stop their own personnel during a mission attempt? But when used properly, Locutus becomes a powerful tool for the Borg dissidents. He can protect key personnel from a fate worse than stopping, or thin out the "wrong" type of personnel for certain dilemmas. There are other, more creative ways to use his ability, but I’ll leave the community to figure those out. I hope everybody has as much fun playing with Locutus as I have had in creating him. So break out those Delta Quadrant missions, tap into Unimatrix Zero, and make sure some of your personnel are only Mostly Assimilated, because The Next Generation is coming your way!